Avoid adding square footage to the space: Increasing the physical space of your kitchen will undoubtedly be a costly and timely endeavor. Utilize other ways to get more space in your kitchen, such as commandeering a nearby closet for storage or getting creative with furnishings. This is the best way to get the most out of a Gilbert kitchen renovation without running into issues with pulling permits, framing new rooms, etc. Know where to splurge: If you want to spend a few extra bucks creating something visually amazing, put your money in flooring and cabinets. These are the two larger components of your kitchen and the things that people often see first. So, if you are going to splurge, this is the area in which to do so. For Arizona kitchen cabinets, you might to incorporate bright and bold colors – red cabinets, for instance, are hot, hot, hot for 2013 — and utilize a complementary hue for your flooring. Remember, quality matters here as well, so this is the time and place to get the best materials that you can afford. It is also good to remember during Gilbert , AZ kitchen renovations that more expensive doesn’t necessarily mean better. You might splurge on a kitchen appliance only to find that it works about as good as the version that cost half of what you spent. Invest in those items that have a return on investment for your renovation; kitchen appliances don’t generally fall into this category. Do-it-yourself where possible: Not everything in your Gilbert , AZ kitchen renovation needs to be done by a professional. Determine which elements fall under this category and where you can save a few bucks by doing something on your own. Research, research, research: The more you research products you put into your newly renovated kitchen space, the less you will contend with buyer’s remorse. 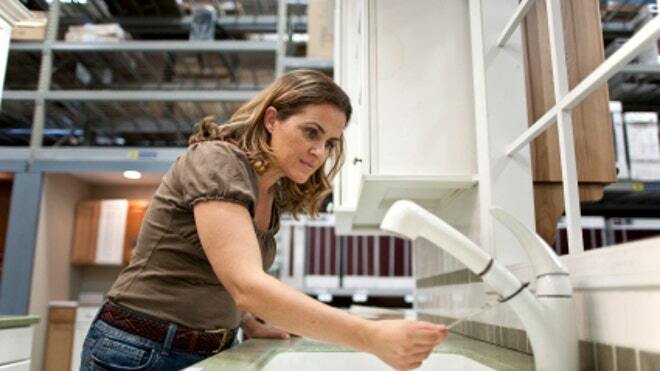 Look up various products and compare pricing and specs on each, so that your choices – such as faucets, design elements, etc. – are the best you can afford. Do-it-yourself where possible: Not everything in your Gilbert, AZ kitchen renovation needs to be done by a professional.